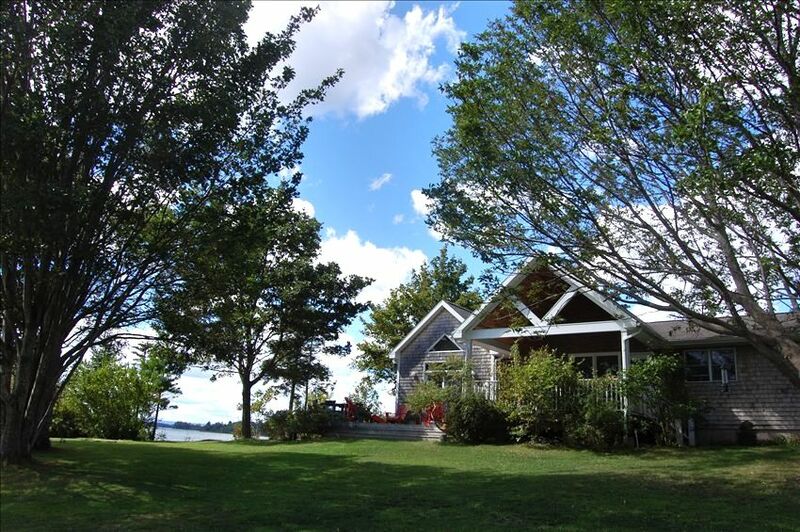 The Artist's Beach House is situated on the Antigonish Harbour just ten minutes from a lovely university town. This quiet retreat feels like it’s worlds away. The house is surrounded by water – on 6 acres of land. The beach goes on forever and is nicely secluded – swimming is excellent in the warmest waters north of the Carolina's. So is canoing and kayaking on the harbour where there’s so much to discover. The grounds are truly spectacular with gardens everywhere including an herb garden for the gourmet. In season, the best lobster in the world can be had fresh off the boats nearby. This architect designed house is ideal for entertaining with wrap around decks and porches complete with ample outdoor eating areas. We have a wheel chair ramp on the back deck which makes the whole first floor with two bedrooms accessible. Indoors you’ll be greeted with warm cherry wood throughout, walls full of original art, oriental rugs on the floors and sumptuous furnishings everywhere. All the amenities are there to pamper you during your stay including a portable crib and high chair for the little ones. When the nights are cool there’s nothing better than curling up in front of the fireplace with a good book or movie. The atmosphere is warm and friendly, colorful and artistic. The views from every room are spectacular. All of our guests tell us that the photos don’t do it justice. It truly is a beautiful place! I fell in love with Nova Scotia as an art student in the 1970's. I returned to Ontario to complete my education and life took over and I stayed. In 1994 in a quest for peace and harmony I moved back with my young children. I was so fortunate to discover Antigonish and this magical property that I purchased in 1998. Since then I have been cultivating my friends, my house, a guest cottage where I stay in the summer, and the surrounding gardens. Now that my children are grown I'm delighted to welcome guests from around world to experience what I am lucky enough to enjoy every day. Being close to nature on the land and in the sea is a privilege that I wouldn't trade for anything. I watch eagles dive for prey from my windows and welcome a pair of great blue herons every spring. The pair of pileated woodpeckers in the forest are a thrill to discover when they allow themselves to be seen. The sounds of the tidal waters are a dream and jumping into them after a day of gardening in the hot sun is about as good as it gets. I visit my friends across the harbour in my canoe and every summer I hear them hollering my name from their sailboat just offshore. As an artist I am most inspired by the profound beauty that surrounds me in my little piece of heaven. We have a wheelchair ramp that can be installed upon request. Tiiu's property has everything you need and so much more. Thank you so much! Perfect Home for a Family Gathering! Tiiu’s home is the ideal place for family or friends from near and far to get together. The house itself is lovely and spacious and the setting is beautiful. We were able to take turns preparing meals and the well stocked cupboards meant that we didn’t have to bring all the basic supplies with us. Tiiu was friendly and welcoming and made sure that we had everything we needed. We loved our family vacation at The Artists cottage. The house is very spacious and fully stocked, we had everything we needed when we were there. We especially loved using the canoe and kayaks provided. This house is the perfect distance from town, you still feel like you are away from the city but it’s only a short drive away. The host made herself easily available to us via email for any questions we had and was gracious and came to introduce herself. If we vacation in Nova Scotia again we would definitely stay here again. "A Slice of Heaven" is really A Slice of Heaven! The house was exactly what we needed! 10 of us travelled to Antigonish for the Special Olympics games being held at the university. It was awesome for all of us to be able to stay together in this beautiful 5 bedroom house, which is only 10 minutes from town. We thoroughly enjoyed the beautiful mornings sitting out on the patio overlooking the water. The property is immaculate and the hostess is wonderful! I would 100% recommend this lovely property. I'm glad you enjoyed my home and were such wonderful guests! The house did not seem as spacious as we’d hoped. We did not realize that two of the bedrooms were in the basement with the third being on open room with no door and a tv that didn’t work. The 1/2 bath that was advertised was essentially an outhouse. Kitchen was well stocked. Home was clean except for large ants in the living room. Beds were for the most part uncomfortable. We did enjoy our stay but this is a property we would not rent again. I'm surprised and sorry about this review. All of the guests seemed to have nothing but praise for the home and everyone seemed so happy and nice. If they had problems I would have addressed them immediately. For the record, the mattresses on the beds are of the highest quality and quite new. But some people prefer harder while others prefer softer. That's always a tough one. The ants probably came in with firewood that guests would have brought in. That problem will be dealt with. The TV in the basement is a relic that we use only to play kids Disney videos on VHS. We don't offer it as a regular TV. The outhouse is also an entertainment. It's a composting outhouse perched on a ledge overlooking the harbour - with Dutch doors - the best outhouse view anywhere! I guess not everyone gets it. One of the bathrooms is newly renovated and very beautiful and the house is always fresh and upgraded. All of our reviews over the years have been excellent so I was quite perplexed with this one. We had an amazing relaxing family trip. We had bonfires by the water, the kids fished and kayaked. We painted pictures, played bocce on the great lawn and grilled at night. There is nothing needed and an an amazing breeze. We drank coffee on the deck in the morning watching the eagles above. Definitely come here for a Nova Scotia retreat. I'm so glad you enjoyed your vacation here. I loved your happy energy! The property is located on a pebbly beach with 1200' of waterfront. In addition there are many beautiful sandy beaches within boating and driving distance that are relatively uninhabited. Antigonish is a university town and often has interesting activities associated with the university. It's also a community rich in the arts.